Leelanau County’s own Ken Scott has photographed his home turf in every season for more than three decades. 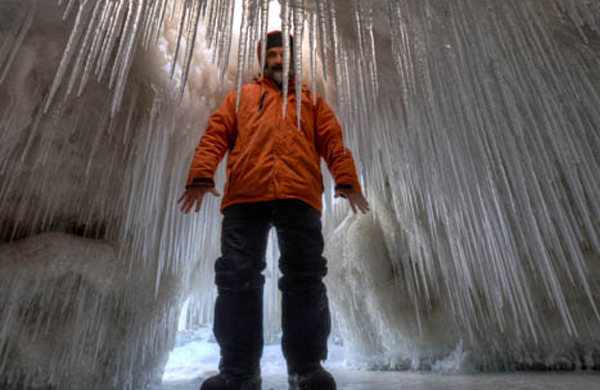 At the Glen Arbor Arts Center’s January 20 Talk About Art interview, Scott discusses photographing the region in winter, and the spectacular ice caves that formed on Lake Michigan in 2014. The Talk About Art interview is 2 pm and open to the public without charge. Never timid about creating photographs in any weather, Scott’s winter and ice cave images are iconic, and were compiled into a hardcover book published by Leelanau Press in 2014. A self-taught photographer, Scott’s image-scouting trips find him along the shoreline or deep in the backwoods hauling his digital camera and tripod. His work is seen weekly in the Leelanau Enterprise’s “Back Page” feature. Talk About Art with Ken Scott is offered in conjunction with the GAAC’s exhibition “Winter,” which continues until February 28. The GAAC is located at 6031 S. Lake Street, Glen Arbor.